Cooking pork loin is an easy process and a quick meal idea. 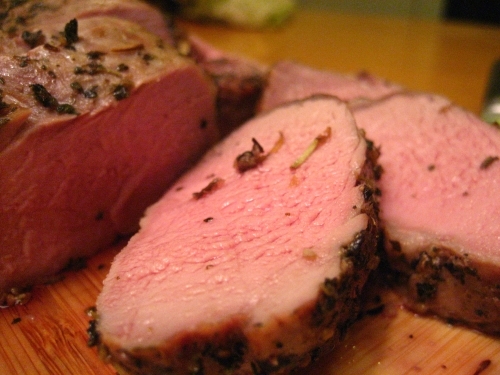 Knowing how to cook pork loin is easy with the following recipe. It is called Lemon Garlic Pork Loin. Start by washing off the pork loin and butterfly both halves. Place onion, garlic and cloves on the inside of the loin. You will need to hold the pork loin halves together with toothpicks. Pour Mike’s Hard Lemonade over pork loin and let marinate for 30 minutes. Cook at 350 degrees for 30 minutes. Pork loin offers many side dish choices. Pork loin goes well with summer vegetables (squash, cucumber and pumpkin) as well as potato dishes. Red and white wine go best with pork loin. Pork boasts many health benefits. Pork is a great source of quality protein and healthy fats. Pork is also a great source of iron and vitamin B12.